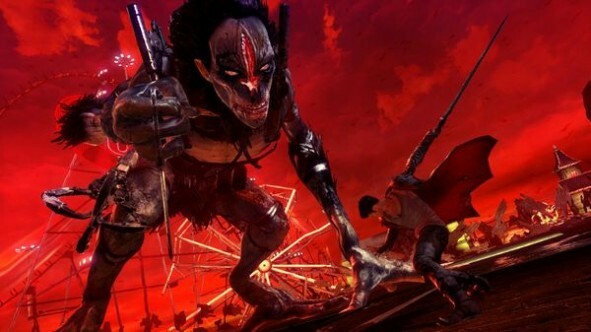 Since it was first unveiled at the 2010 Tokyo Game Show, Capcom and Ninja Theory’s new take on the beloved Devil May Cry franchise has been practically drowning in controversy. Sporting a new developer, a new setting, and an unrecognizable new Dante, the game had already disappointed several series fans, despite being years from release. It seemed that the more Capcom revealed about the game, the more rabid the devout series fan-boys were becoming. Now the game is finally out and is being promoted as one of the first major releases of the year. 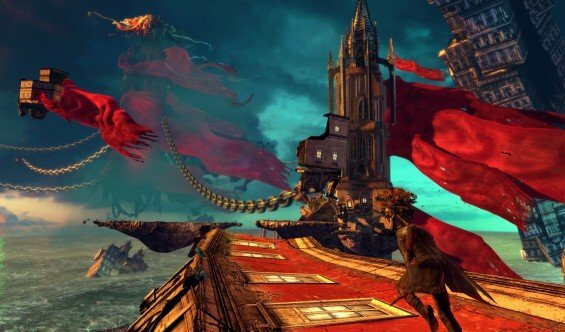 So, has Ninja Theory and Capcom’s reckless abandon of the tried and true Dante paid off or have the naysayers been right all along? If you’ve played past series installments, the first thing you’ll notice upon booting up Devil May Cry is the visual stylistic change. Dante doesn’t look or behave like the Dante you know and perhaps love. Gothic cathedrals no longer play host to the majority of the heated battles. The almost Castlevania-esque motif is nowhere to be found. The game has a distinct, individual attitude. Comparisons to the other games are impossible to avoid, but you quickly realize that Ninja Theory didn’t set out to create Devil May Cry 5. 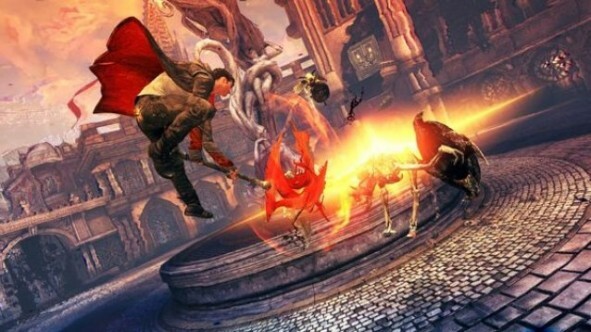 This is their vision of Devil May Cry and though it bears a few similarities to other series entries, it’s readily apparent that this title sets out to do its own thing. 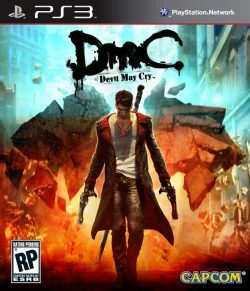 Story-wise, this is the richest a DMC title has ever been. The new Dante has a serious love interest and a background that is explored in some depth. The relationship between Dante and his brother Vergil is elaborated. The setting, the characters and enemies are all interconnected. It is definitely the most story driven Devil May Cry title to date. 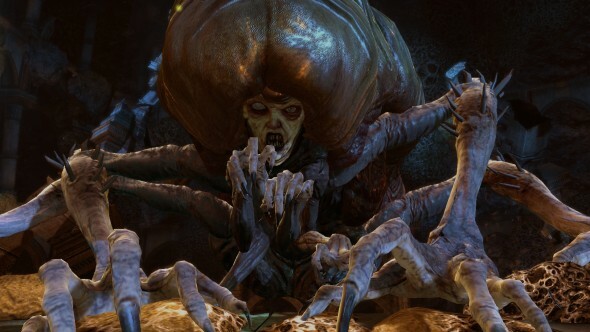 The villainous Mundus has enslaved the world through various dastardly methods, neither of which is the main reason Dante could have it in for him. The surprise plot twist towards the end kind of caught me off guard but not entirely because you could see it brewing little by little over the course of the game. As the ending credits rolled, I felt truly satisfied with the plot and narrative of the game and I understood each and every event that transpired. I can honestly say I’ve never felt that way after playing any series entry before this one. Some of the writing is a bit cheesy and for most of the game the crass, potty-mouth Dante is borderline unlikable. These faults didn’t keep the game’s overall plot from being entertaining. The environments are colorful, eye-catching and intricately designed. 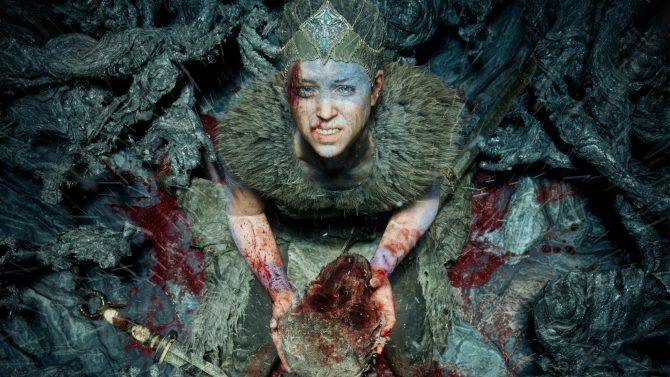 This is one aspect of the game that Ninja Theory definitely deserves merit for. The enemies look nightmarish and gruesome. Visually the game shines, but it definitely isn’t because it has wonderful graphics. The graphics are solid but the stage and enemy designs are what really stand out. The vivid use of colors and the dreamy and at times kaleidoscopic environments and designs really make the game pop off the screen. Several visual flourishes, such as the bright blue light that flashes to indicate a point to which you can angel pull, are pleasing to look at. The setting is more modern or even futuristic compared to the older games. The PS3 version of the game does seem to suffer from a few technical hiccups. I experienced laggy and overall jittery visuals more than once during cinematics. Those issues aside, the game is gorgeous and you’ll spend a good deal of time simply observing some of the exceptional stages and enemies. Unfortunately, I’m less than a fan of the game’s soundtrack. The Noisia and Combichrist forged soundtrack contains trace amounts of metal and even dubstep. The music seems somehow appropriate for the game but not generally enjoyable. None of the songs ever got stuck in my head the way the DMC4 battle theme did and most of the music just sounds irritating and touch-and-go. In my opinion the series has definitely sounded better in the music department than it does here. The voice acting is solid, even though there are very few characters. Dante’s voice actor perfectly conveys the snide, vulgar individual he has been designed as in this outing and Vergil sounds sophisticated and thoughtful. The sound effects sound fine as well, with every gunshot and swipe of the sword accompanying an appropriate sound. I think DmC’s soundtrack falls a bit flat, but the game hits other high notes well enough for this to be overlooked. 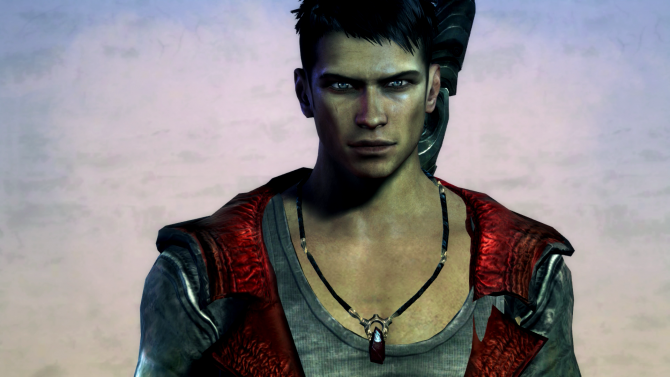 While the characters and narrative are surprisingly well developed for a DMC game, the heart of this series lies in the game-play or – more appropriately – the combat. 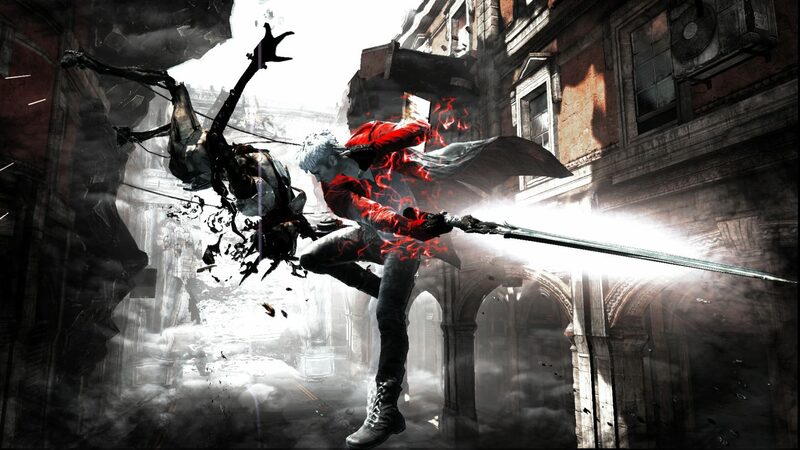 DmC takes a rather unique approach to Dante’s weaponry than in past games. In DMC3 and DMC4, Dante had a wide variety of different fighting styles. These fighting styles – such as sword master and royal guard – determined which techniques the player would have at their disposal. You could also choose from a big variety of weapons and firearms. In this title Dante doesn’t have different fighting styles but he does have different weapons. Parrying, teleporting and advanced dodges can be accessed without needing to switch from the trickster to royal guard styles and etcetera, though they need to be unlocked first. 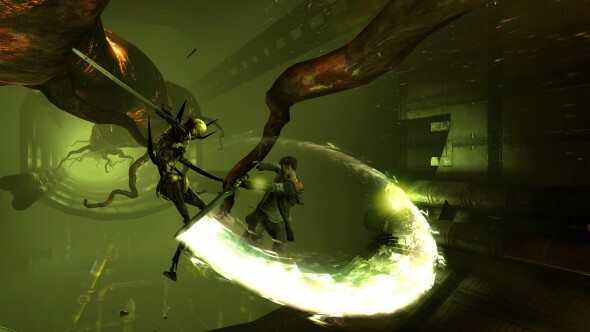 Overall combat speed does feel a pinch slower than it did in DMC3, but the action is still very fast paced. Nero’s Devil Bringer from DMC4 has been lifted and refined into a demon and angel pull for DmC. The demon pull snatches a distant enemy to Dante while the angel pull brings Dante to the enemy. Dante also has a variety of angel and demon weapons. Accessing his angel weapons and angel pull requires making inputs while holding down the left trigger button, while the demon techniques and weapons can be accessed while holding down the right trigger button. Switching weapons can be done quickly by hitting a direction on the d-pad. Having to hold down the shoulder buttons while executing certain combos takes some getting used to. Once you get the hang of everything though, you will have some flashy and satisfying combos at your disposal. The controls are responsive and Dante usually acts the moment you hit a button, which is good. The combos you’re shown at the loading screens are only a fraction of what Dante is capable of. There aren’t several weapons to choose from in the game, but this isn’t a huge deal because each weapon feels unique and different. In general, the demon weapons are slow and heavy hitting while the angel weapons are swift and flashy. The style ranking combo system is back, though it’s much more generous than it ever was in the older games. Your grade also doesn’t slowly descend if you stop attacking. Your grade only drops if you get hit or if you repeat the same attack an absurd amount of times. You’re graded on the stylishness of your combos. Switching between weapons and chaining together several attacks will net you big style points. Repeating the same attack or series of attacks won’t raise your score as much as a long series of unique attacks. Performing exceptional combos will help you get more skill points. Skill points can be used to unlock new abilities for Dante. You can unlock new techniques for each of the weapons, as well as unlock techniques for Dante himself (such as an advanced dodge) using these skill points. 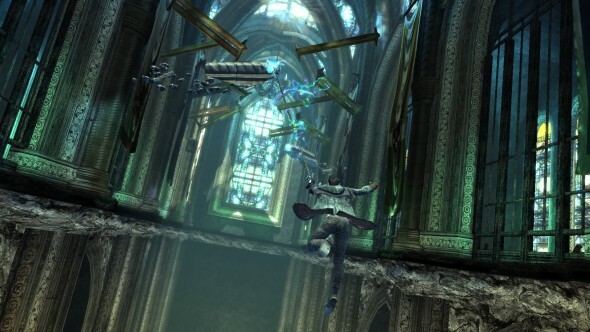 Several techniques – such as the prop shredder, death coil and million stabs – make triumphant returns from past games, and it’s exciting to see them amidst such a different DMC title. There are several upgrades to unlock and unlocking them expands the fun and depth of the combat significantly. Devil trigger mode grants Dante bonus damage and style points while slowing all enemies down to a crawl. His health also regenerates while devil trigger is active. Though it seems like it could be effective, I actually didn’t get much use out of the devil trigger. My main issue with the combat is how long and crippling the execution period is for some attacks. Some attacks cannot be dodge-cancelled out of, which is something that I’m still getting used to after a dozen hours of playing. Basically, Dante is locked into certain attacks for a certain amount of time. This is only a huge problem if you’re the type of player who likes to continue attacking until the very instant before an attack connects. In Bayonetta or DMC4, you can do this because dodging will cancel pretty much whatever the character is doing and allow you to safely evade the attack. In DmC, trying to play this way got me smacked several times, dropping my hard earned style score. This isn’t really a fault if you get into the swing of things and play by the game’s rules, but it was something I had a problem with. It’s also possible to stay in the air indefinitely with clever use of the angel pull, which cuts the challenge of the game by a bit. These are my only major gripes with the combat. 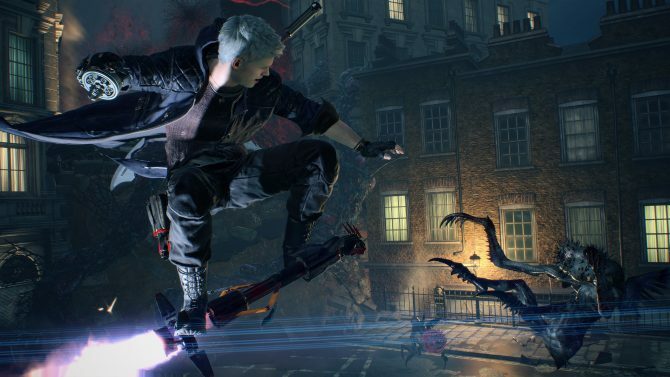 A few more weapons wouldn’t have hurt either, but in summary the combat is fast, fluid and responsive – like combat should be in a DMC game. The removal of the styles and the smaller arsenal of weapons can be viewed as either streamlining the combat or simplifying it – this depends on your perspective. There is a big variety of different enemies and the same tactics will not work on each of them. Many series fans were worried about the game being too easy, but after playing a few stages on the Son of Sparda difficulty setting, I can say with certainty that the blend of different enemy types and tactics should keep you on your toes. Even if Son of Sparda is too easy for you, I have trouble believing that you wouldn’t get a thrill out of Dante Must Die or Hell and Hell mode. The biggest component of this game besides the combat is the platforming. Past series installments did incorporate platforming, but it’s never played quite as big of a role as it does here. Dante’s demon and angel pulls are used to traverse a variety of different obstacles. He also gets an angel glide a bit later for further platforming shenanigans. The platforming allows Dante to interact with the games various changing and entertaining environments. It also feels smooth and responsive, like the combat. Scattered throughout the lovely stages are lost souls and a variety of hidden keys which unlock a variety of hidden doors. The lost souls give you red orbs and increase your completion rating at the end of each mission. 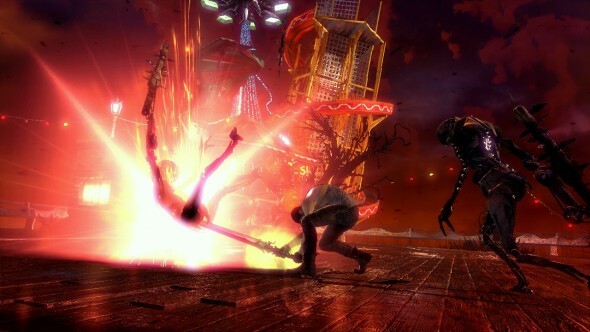 In traditional DMC style, you are also graded on how well you performed in each mission. The hidden doors contain secret missions, another series staple. These vary in difficulty, but I only completed about four of them my first time through because most of the keys seem to be hidden very well. This is welcomed, though, as it makes you really search and scour each level. Completing various feats in the game will unlock concept art for you to view in the game’s gallery. This addition is appreciated, as you can get a detailed look at some of the interesting and hellish enemy designs. The unlockable art, combined with the hidden souls, keys and doors and fun combat makes the game’s replay value fairly high. On top of that, there are numerous more challenging difficulty settings to unlock. Clearing Nephilim (or Devil Hunter) difficulty unlocks Son of Sparda. Clear that to unlock Dante Must Die. Clear that to Unlock Heaven or Hell mode and so on. These enhanced difficulty settings promise a greater challenge to anyone who has blasted through the default mode and is looking for a more sadistic challenge to sink their teeth into. The online leaderboard makes a comeback from DMC4. You can see who has cleared a stage with the most style and points and see how you stack up against the most skilled players. I was surprised at the number of my PSN friends who went out and grabbed the game on launch day. Earning a higher score than your friends can foster friendly competition and motivate you to do your best in every stage. In the end, Devil May Cry is a fresh spin on a series that while beloved is getting up in the years. Comparisons to the games that made the series the juggernaut that it is are unavoidable, but this game is best approached with no predispositions. Only then can you fully appreciate its rich, vivid setting, smooth, fluid combat and enjoyable, relatively engaging story. The new Dante may be a complete jerk, but he’s worth bearing to engage a big variety of demons in fast, satisfying combat throughout some beautiful stages. 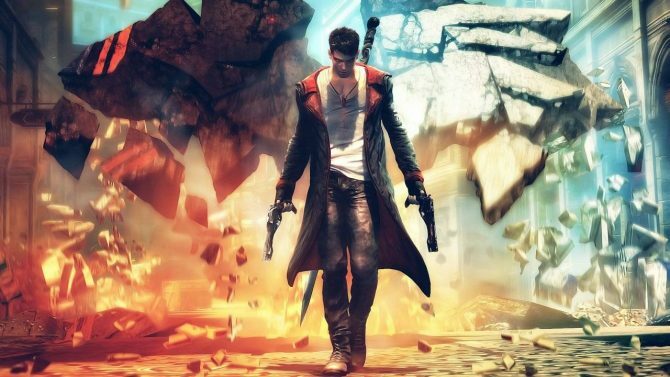 The storied franchise history aside, this game deserves to be judged on its own merits and demerits – and in that regard, DmC is very much worth playing.